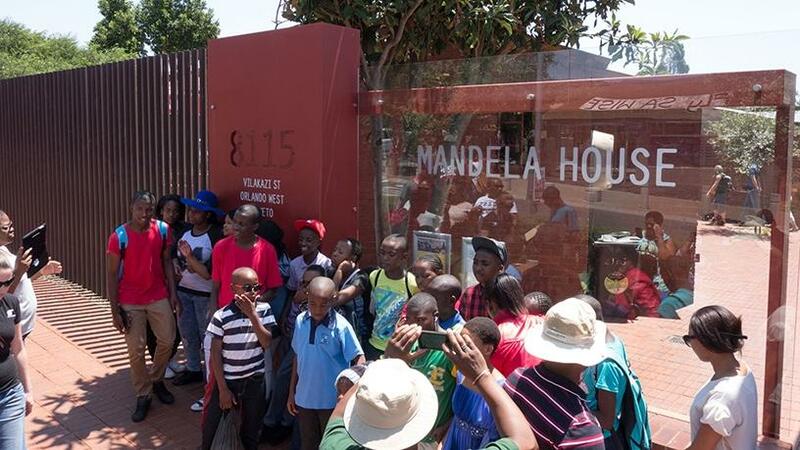 The Mandela house in Vilakazi Street, Soweto, will be one of the buildings that will be part of the 5G trial. South Korean hardware manufacturer Samsung has partnered with wireless infrastructure provider Comsol to test a live 5G pilot network in restaurants on Vilakazi Street in Soweto. Samsung says it decided to work with Comsol because of the company's access to the largest tranche of contiguous 28GHz in South Africa. Last month, the global Samsung group announced it would invest 25 trillion won ($22 billion) in artificial intelligence, 5G mobile technology, electronic components for autos, and the biopharmaceutical business in pursuit of new growth areas. "I am very happy that the first 5G network in South Africa is being launched in a township," says David Makhura, premier of Gauteng. "The Gauteng provincial government has invested quite significantly in turning the face of townships, to ensure they become spaces where black, youth and woman-owned enterprises thrive. Part of that is to invest in infrastructure, and one of the most important infrastructure investments is in communication." The pilot network was officially switched on today at the launch event at Uncle Tom's Community Centre in Orlando West. Within the coming months, patrons at restaurants in Vilakazi Street, visitors to the Nelson Mandela memorial, as well as local residents will be able to experience speeds of up to 1.8Gbps per user. It will be free to use for anyone in the area to experience it until the end of the year. Comsol says it plans to move from trial to full commercial deployment next year. "Vilakazi Street is the family home to two Nobel Prize laureates, and one of our nation's boldest symbols of transformation and progress," says Comsol CEO Iain Stevenson. "In our own way, we want to play a role in South Africa's future as we embrace the digital economy, showcasing just what's possible with advanced 5G networks." Other players in the partnership are Dark Fibre Africa, providing fibre backhaul, and MWeb as the Internet service provider. Stevenson explains that while 5G broadly defines the forthcoming evolution of mobile networks over a wide range of frequencies, this specific pilot network is 5G Fixed Wireless Access (5G-FWA). "5G-FWA utilises the kind of network technology that we'll come to associate with the 5G era (the likes of beamforming and a high-frequency millimetre wave spectrum such as 28GHz) to provide an exponential performance boost to wireless broadband services," the companies said in a statement. "For the 5G pilot network service, Samsung provides 5G end-to-end FWA solutions, consisting of 5G outdoor routers (CPEs) and 5G radio comprised of compact mmWave RFICs technologies and ASIC-based 5G modems developed by leveraging Samsung's in-house expertise and assets. With these technical advancements, Samsung has been able to bring one of the smallest 5G radio (radio base stations) and 5G routers (CPEs) to market, which are the world's first 5G-FWA end-to-end solutions certified by the US Federal Communications Commission in the first half of 2018." Comsol chairman Andile Ngcaba says: "This opens the doors to a new world... one where ubiquitous, high-speed networks deliver digital services to millions of citizens at low-cost. 5G will support everything from self-driving cars, to remote medical surgery, new immersive virtual realities, drone deliveries, AI robots, intelligent agriculture, connected cities, smart logistics and more." Vodacom recently announced it has commenced commercial deployment of 5G technology in South African neighbour Lesotho. Vodacom says it has created a standards-based, commercial 5G service in Lesotho using 3.5GHz spectrum to deliver fixed-wireless access broadband services to two enterprise customers in the landlocked country.